CAPTION: HFC alumnus and current welding instructor Kevin Ridge shows off the sign he forged out of iron for the new coffeehouse in Howell that he will open in 2019: Black Iron Coffee Roasters. 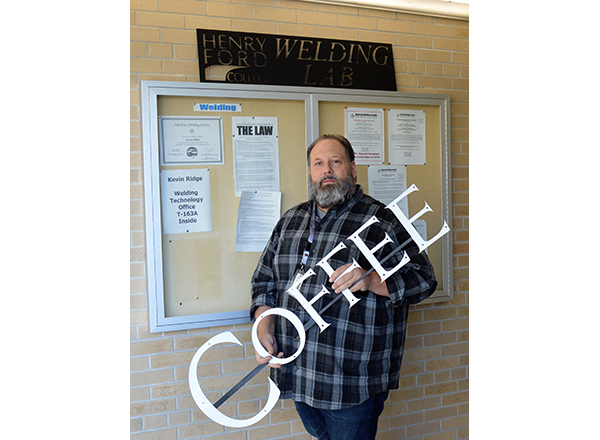 Around 25 years ago, in order to stay awake when watching a week’s worth of safety videos, HFC alumnus and welding instructor Kevin Ridge discovered coffee. The taste was bitter and unpleasant, but it did the trick and kept Ridge awake. Ridge researched coffee and began roasting his own beans at home. He experimented with coffee beans from around the world to develop his original homemade blends. At first, roasting was a hobby. He gave his coffee to friends and coworkers as gifts. Getting into the coffee business was a grassroots effort. Ridge started selling bags of coffee, roasted by hand, at various farmers markets in the Tri-County area. He also makes custom blends for several businesses and sells them online. “I began doing this three years ago. I wanted to do something on the side, unrelated to welding, so I bought a commercial roaster,” said Ridge, who has taught at HFC since 2000. His coffee’s been a big hit with his colleagues and students, including Robert James, associate dean of the HFC School of Business, Entrepreneurship, and Professional Development. In fact, Ridge brings his own blends of coffee into his classroom for his students to enjoy. In early 2019, Ridge and Darcie, his wife of 24 years, plan to open Black Iron Coffee Roasters – the first brick-and-mortar store – at 119 W. Grand River Ave. in Howell. He will hand roast specialty coffees on-site. He personally forged the sign for the coffee shop out of iron. In fact, keeping with the metallurgy aspect of his life, Ridge couldn’t help but name his house blend coffee – which contains notes of sugar cane, nuts, and fruits – Blend 26, after the atomic number of iron. His Cast Iron Espresso Blend is a dark roast with hints of chocolate and caramel. Wrought Iron Blend is his newest signature blend, featuring beans from Kenya and Papua New Guinea. “There’s been an explosion of coffee shops all over the place, so we decided to start our own,” said Ridge. His wife will run the day-to-day operations of the shop, and they plan to hire a manager and other employees. Down the line, when Black Iron is on solid ground, they plan to introduce a menu featuring soups and sandwiches, as well as cookies – all made on-site. Black Iron will also feature live music. That doesn’t mean Ridge has any plans to quit teaching at HFC. To learn more about the new coffee shop or to order merchandise, visit www.blackironcoffee.com. Merchandise currently available includes custom iron pour-over stands, mugs, T-shirts and more.